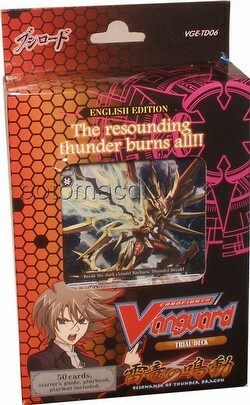 Resonance of Thunder Dragon is Cardfight Vanguard Trial Deck 6. Each deck includes these cards: 1x Thunder Break Dragon, 2x Djinn of the Lightning Flash, 4x Plasmabite Dragon, 4x Thunderstorm Dragon, 4x Shieldblade Dragon, 1x Djinn of the Lightning Flare, 2x Brightjet Dragon, 4x Red River Dragoon, 4x Lizard Soldier, Riki, 2x Lightning of Hope, Helena, 1x Djinn of the Lightning Spark, 2x Dragon Dancer, Rairai, 2x Wyvern Supply Unit, 1x Lizard Soldier, Sishin, 4x Yellow Gem Carbuncle, 4x Old Dragon Mage, 4x Zephyr Kid, Hayate, & 4x Demonic Dragon Nymph, Seiobo. Also included are a starter's guide, a playbook, and a playmat.